“Plugging into a Vox amp is like giving your dream car a meticulous wax and polish or like adding generous amounts of maple syrup to your pancakes. Every single Vox amp I have EVER plugged into has given me an unexpected amount of sparkle and glean which makes my electric sound much better than it deserves. The sound is always glorious in its own way, from the tiny little fellas to the beasts." 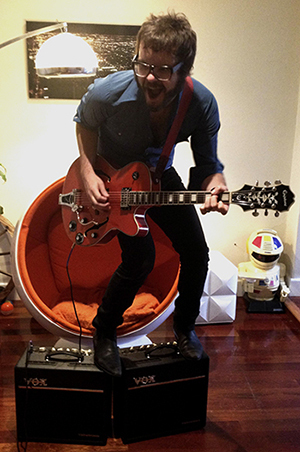 HENRY WAGONS, named one of Melbourne’s Top 100 Most Influential People in 2009, is unanimously lauded as one of Australia’s great entertainers. Along with his rare charisma he offers heavy doses of stomping outlaw country, irresistible crooning and classic song writing. Henry has released 5 albums and made his North American debut with the 2011 release of Rumble, Shake and Tumble on Thirty Tigers and Six Shooter Records resulting in National Public Radio getting on board with “I Blew It” featured as ‘Track of the Day’. In both the live forum and on record, Henry draws upon an uncommon range of influences given the current musical climate, including jump suit era Elvis, Roy Orbison, Johnny Cash, the grit between the floorboards at the Ole’ Opry, the spit in 70’s trumpet sections and Cormac MacCarthy’s psychedelic Westerns. His live show is a performance like no other, treading a line between a Vegas 70s showroom extravaganza and a bunch of fresh-faced undertakers letting loose at a rained sodden rock festival. Having spent the last few years touring with the likes of Lucinda Williams, Justin Townes Earle, Edward Sharpe and The Magnetic Zero’s, Calexico, Bill Callahan, Will Oldham, Okkervil River, John Hiatt, Jolie Holland and just recently completing a 16 date USA tour including SXSW and Americana showcases, it is safe to say that Wagons is a road hardened formidable live act. Henry Wagons could not be named a shrinking violet. While many other front men take gentle place in the calm of a shady palm tree and sing humble acoustic love songs on their solo debut, the Melbournian entertainer has far more bombastic plans. After five albums with his band, Wagons, Henry strikes out on his own - with the help of six stellar guests: Alison Mosshart (The Kills, The Dead Weather), Sophia Brous, Canada’s Jenn Grant, Robert Forster (The Go-Betweens), Patience Hodgson (The Grates) and Gossling. A new band has been enlisted as he premieres this brand new round of songs where it takes two to tango.